Today, healthcare workers are highly aware of the risk of Type I allergies resulting from exposure to latex. Made of 100% nitrile, Ansell’s MICRO-TOUCH® Nitrile E.P.® gloves contain no natural rubber latex and are powder-free. They provide an effective barrier protection against punctures and a wide range of chemicals, while the white colour reveals soiling and contamination. 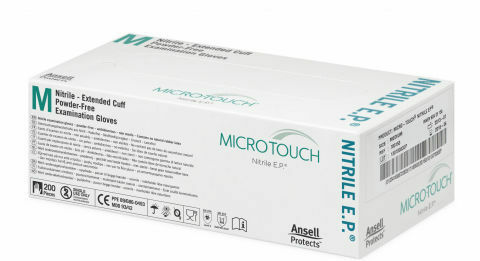 At 265mm, MICRO-TOUCH® Nitrile E.P.® offers additional lenght for extra protection. MICRO-TOUCH® Nitrile E.P.® provides latex-like comfort. ‘Thermo-elastic’ material that adapts to the shape of the hand ensures even greater comfort, while an inner polymer coating makes donning easy and the absence of powder considerably reduces the risk of skin abrasion. The micro-textured finger surfaces ensure a good grip on instruments. The combination of easy donning, supreme comfort and sure grip make MICRO-TOUCH® Nitrile E.P.® the optimal choice of many healthcare professionals. Moreover, the 200-count packaging reduces waste and saves on costs. This examination glove, CE Marked as Class I Medical Device, is additionally certified and CE Marked as Category III Personal Protective Equipment, ensuring more consistent quality and providing protection for a wide range of applications.